Randy Ingermanson is the award-winning author of six novels. He is known around the world as "the Snowflake Guy," thanks to his Web site article on the Snowflake method, which has been viewed more than a million times. Before venturing into fiction, Randy earned a Ph.D. in theoretical physics from the University of California at Berkeley. Randy has taught fiction at numerous writing conferences and sits on the advisory board of American Christian Fiction Writers. 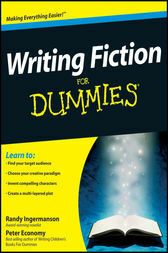 He also publishes the world’s largest e-zine on how to write fiction, The Advanced Fiction Writing E-zine. Randy’s first two novels won Christy awards, and his second novel Oxygen, coauthored with John B. Olson, earned a spot on the New York Public Library’s Books for the Teen Age list. Visit Randy’s personal Web site at www.ingermanson.com and his Web site for fiction writers at www.AdvancedFictionWriting.com. Peter Economy of La Jolla, California, is a bestselling author with 11 For Dummies titles under his belt, including two second editions and one third edition. Peter is coauthor of Writing Children’s Books For Dummies, Home-Based Business For Dummies, Consulting For Dummies, Why Aren’t You Your Own Boss?, The Management Bible, and many more books. Peter also serves as Associate Editor of Leader to Leader, the Apex Award-winning journal of the Leader to Leader Institute. Check out Peter’s Web site at www.petereconomy.com.